Lucas Parker, a sophomore in aerospace engineering, mechanical engineering and engineering management at Missouri S&T, is obsessed with fitness. From lifeguarding to coaching a gym class at The Centre, Rolla’s Health and Recreation Complex, Parker spends a lot of time taking care of his body and encouraging others to do the same. And he’s been this way his whole life. In high school, Parker rode his bike to school every day. 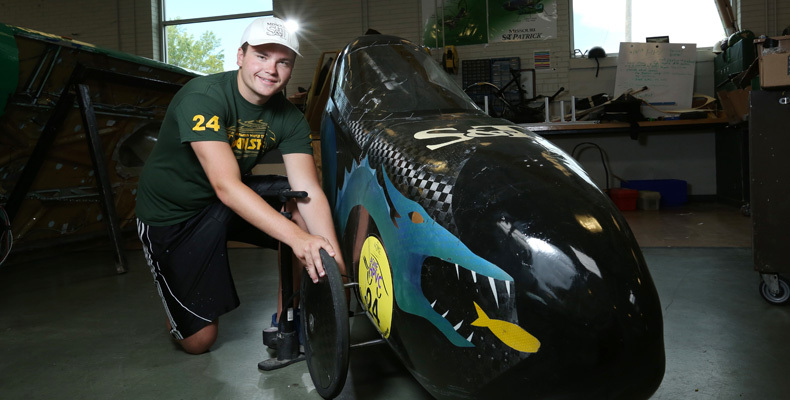 So, when he came to S&T and wanted to join a design team, he found the perfect fit in the Human Powered Vehicle Competition Team. Each year, the team designs, builds and races an aerodynamically fitted recumbent bicycle or tricycle. This year the team earned first place at the American Society of Mechanical Engineers 2015 Human Powered Vehicle Challenge East Coast Competition in Gainesville, Florida. Parker says the team is more than a learning experience — it’s a life experience. Though he loves being part of the team, Parker says that he enjoys teaching others teamwork just as much. When he coached soccer at Gene Slay’s Boys Club in the Soulard neighborhood in St. Louis, he learned just how much he loved it. When Parker is not busy encouraging others to stay healthy, he’s focused on keeping himself healthy. In any free time, the Kappa Sigma fraternity member plays sports with friends and lifts weights in order to stay healthy for Air Force ROTC. Fitness is an important part of his life, sure, but he says it’s not the only thing he’s focused on.